The DC-based real-time viscosity, Tg and degree of cure online estimation is a unique accomplishment which revolutionises composites manufacturing. 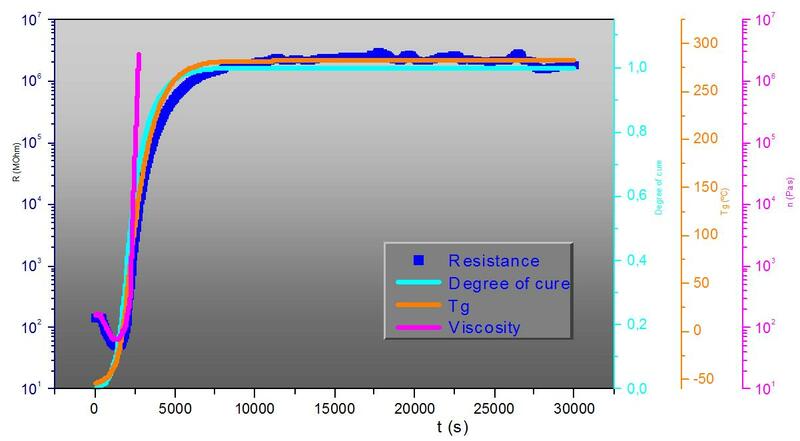 The use of resistivity in cure monitoring through its direct measurement by the use of Direct Current has been explored by several scientists [1, 2] while an extended report on the use of the Resistance-based cure monitoring for vinylester resins can be found here. The DC-based cure monitoring has been always tempting for industrial cure monitoring as more recent research results on using DC-based electrical measurements for cure monitoring in aerospace composites can be found in [3, 4]. However besides the numerous advantages of the DC-based cure monitoring in composites, the main obstacle was the lack of reliable devices to measure such high resistivity forcing scientists to use the conventional dielectric equipment where a range of sinusoidal electrical excitation is applied to the resin. Although significant effort has been devoted in the dielectric-based cure monitoring for more than 30 years only laboratory scale equipment and limited industrial applications exist. At 2009 Synthesites introduced the first DC-based cure monitoring system with a clear focus on composites manufacturing. The system  measures directly the resin's resistivity and the temperature using proprietary sensors, advanced electronics and a proprietary software and is capable of the in-situ monitoring of the complete transformation of thermoset or reactive thermoplastic resins i.e. from very low viscosities at high temperatures to fully cured resins at room temperature with the resistance ranging from 10^5 Ohm (100 KOhm) up to 10^14 Ohm (100 TOhm). Through the years, this technology has been adopted by major R&D and University centres across Europe but what is the most promissing is the adoption of Synthesites technology by major industrial players in aerospace, automotive and wind energy sectors. Comparison between the DC-based monitoring and commercial dielectric systems both using durable sensors showed the superiority of the DC sensing particularly after gelation where conductivity is measured by the DC-based system in a more reliable way. Furthermore, the DC sensing is faster, relatively cheaper and requires simpler sensors which can be more flexible in geometry and can be installed in several locations in the mould, in the die, in the feeding or in the vacuum lines so a global process monitoring is possible. Last but not least, in contrast to the through-thickness measuring nature of the dielectric systems, the DC sensing is less vulnerable to carbon fibres in the cavity due to its inherited “surface” measuring nature so it may be used in industrial production of carbon fibre parts even without protection. All Synthesites cure sensors have an integrated temperature sensor providing the temperature of the resin which is absolutely necessary for the calculation of the resin state. Viscosity is the most important property for the first step of composite moulding, the fibre impregnation. During this step it is important to maintain the viscosity below a certain threshold in order to ensure good product quality. Using this DC-based monitoring system it is possible to monitor this viscosity in real-time and in the mould in order to check that the fibre impregnation is progressing as planned. Then it is important to identify the gelation and the evolution of the Glass Transition Temperature (Tg). In a special equipment which measures simultaneously the viscosity and the resistivity of a resin at controled temperature, 4 repetitive trials were performed with neat epoxy resin (without hardener). As can be seen in figure 1 both viscosity and resistance are degreasing together as temperature is rising. A comparison between the measured viscosity, the degree of cure and the Tg evolution versus the measured electrical resistance for a low-temp curing epoxy resin is shown in figure 2. Tests that were performed by Tecnalia (ES) at lab scale conditions with a popular epoxy resin showed that the evolution of viscosity at the early stages of the curing can be directly correlated to resistance. Then, there is a region where a sharp increase of viscosity occurs due to evolution of curing and the two curves start to diverge. This divergence becomes more evident at the gelation point from which the resistance curve starts to follow the degree of cure and the Glass Transition Temperature (Tg). Figure 1. Simultaneous measurements of electrical resistance and viscosity of 4 repetitive trials with changing the temperature of neat epoxy resin (unreacted). Figure 2. Electrical resistance, degree of cure, Tg and viscosity correlation at an isothermal curing of an epoxy resin (Isabel Harismendy, Tecnalia). Figure 3. Isothermal curing of an Epoxy resin at three different temperatures: Correlation between resistance and Tg as provided by the TDS. Figure 4. 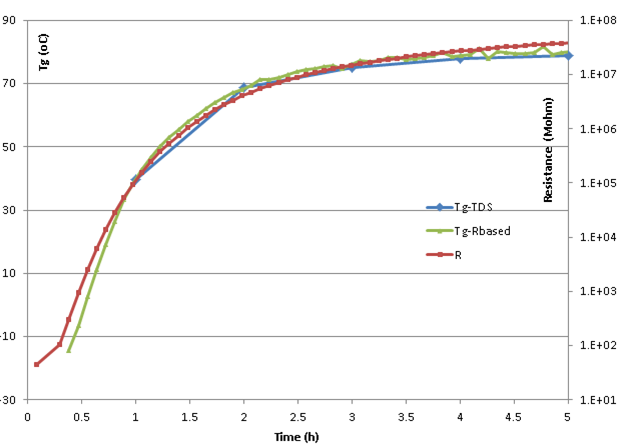 Isothermal curing of and Epoxy resin: Correlation between resistance, Tg real-time prediction and Tg as provided in the TDS. 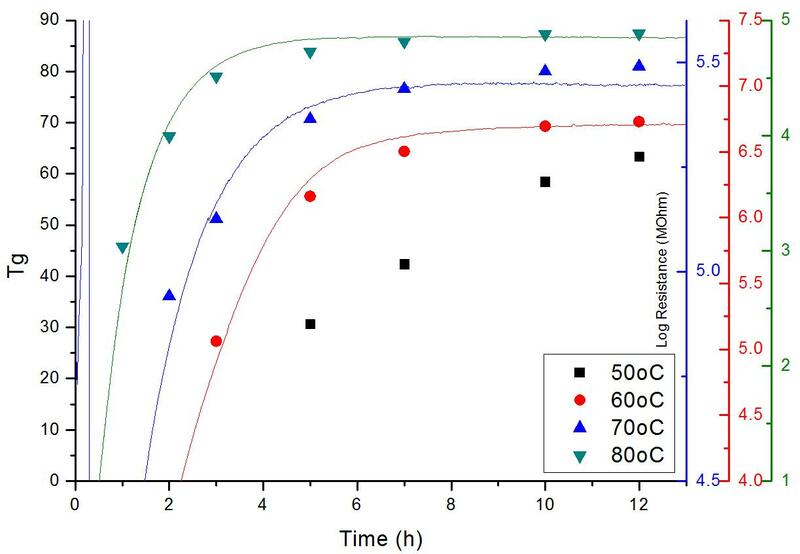 The direct correlation between the electrical resistance and the evolution of Tg during the curing of thermoset resins has been extensively studied (for example ) and it is clearly demonstrated in figure 3 for a typical epoxy system in isothermal curing at different temperatures. In figure 4, in an isothermal curing of another epoxy resin the correlation between the resistance and the Tg as provided by the TDS is shown. On the other hand, research based on dielectrics has failed to extract in real-time accurate information such as Tg or degree of cure in a repeatable and reliable way especially if carbon fibres are involved in the process or temperature is not constant. Synthesites on the other hand has developed and applied successfully a unique intelligent technology for the real-time estimation of the viscosity, the Tg and the degree of cure that can be used in all industrial conditions even when carbon fibres are present (figure 5). Moreover, this technology has been extensively proved at industrial conditions, too. 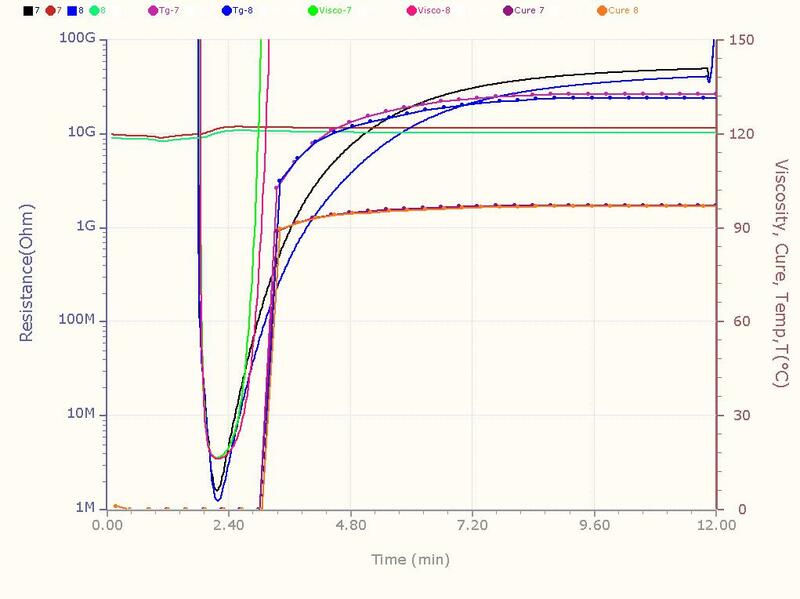 In a series of demo trials of the production of a large cfrp part with snap curing resin it was proven that the real-time estimated Tg was within the statisitcal error (±2%) from the Tg calculated by DSC after demoulding. In a wind blade production it was shown that the DSC accuracy can be achieved by the online ORS Tg estimation for the whole range of representative zones as can be seen in Table 1 . Figure 5. Production monitoring of the injection and curing of a snap-curing resin with CF preform by 2 cure sensors and the online estimation of viscosity, Tg and degree of cure. Table 1. 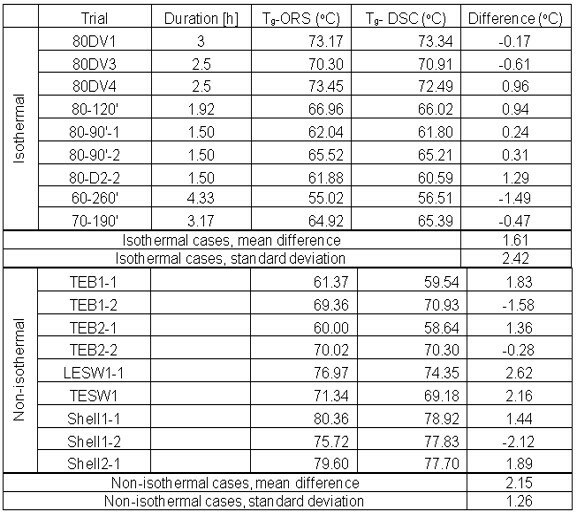 Comparison between the online estimated Tg and the Tg measured by the DSC for various isothermal and non-isothermal cure cycles for a windblade application . Tajima Y. Monitoring Cure Viscosity of Epoxy Composite. Polymer Composites, 3, pp. 162-169 (1982). Schwab S., Levy R., Glover G. Sensor System for Monitoring Impregnation and Cure During Resin Transfer Molding, Polymer Composites 17, pp. 312-316 (1996). G.Boiteux, P.Dublineau, M.Feve, C.Mathieu, G.Seytre and J.Ulanski, Dielectric and viscoelastic studies of curing epoxy-amine model systems, Polymer Bulletin 30, 441-447 (1993). C. Garschke, C. Weimer, P.P. Parlevliet, B.L. Fox, Out-of-autoclave cure cycle study of a resin film infusion process using in situ process monitoring, Composites Part A 43 (2012) 935–944. N. Pantelelis, A. Bansal, I. Harismendy, R. Mezzacasa, E. Bistekos, Intelligent Monitoring of the Infusion of Large Carbon-fibre Reinforced Structural Parts, in: First International Symposium on Automated Composites Manufacturing, 2013, Concordia University, Montreal, Canada. C. Lauter, K-P. Jaquemotte, N. Pantelelis, Improvement of productivity and quality in the wind energy industry through the use of an advanced sensor system, Sampe Journal, V.53/6, pp. 6-10.